You know you should never made a resolution because it’s just so damn hard to keep up with it! For one, the writing resolution. Only the first month of 2010 and I’ve managed to neglect my blog. But I promise I’ve been writing, for FD, less for MD and few for the office. If I can cheat, maybe tweet can count? On another note, I know I post several TO pics. But really, how do you supposed to take pics of TO properly and pose for it properly? I sometimes have the urge to just delete those posts. Lastly, at least I’ve been through the first step of one of my 2010 resolution. I still need luck though. When I told my friend about the result of my failed panna cotta (will tell more later), the respond was … it’s the thought that counts! Completely out of context, but probably was right. In everything in life, first we must have a strong will on what we want to do and then we have the motivation on doing the deed. Or else, it will never happened! Coming back to my cooking challenge, today I accomplish in finishing 4 recipes – one however I have to admit that it failed horribly! 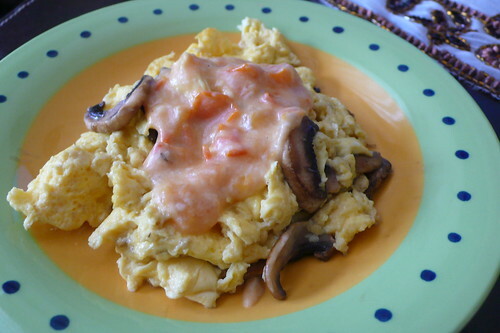 Recipe 3: Scrambled eggs with tomato cheese sauce and buttered mushroom. I was planning to use milk instead of cream but I don’t have the measurement on making scrambled eggs with milk so I gave in to cream instead. I was in between doing this and that so the result is a bit dry but still watery so I can say it’s great success! But tomorrow I shall put more cream because I want it to be runnier. Raysa love the eggs, she just attack it straight away. And the cheese … divine! Recipe 4: Chicken cheese nugget which is actually for Raysa so that the nanny has something easy to cooked during the weekdays. BTW my maid (yes the lovely Nani) quit, so nowadays I don’t have live in maid anymore. I’ve written the recipe on Mommies Daily. 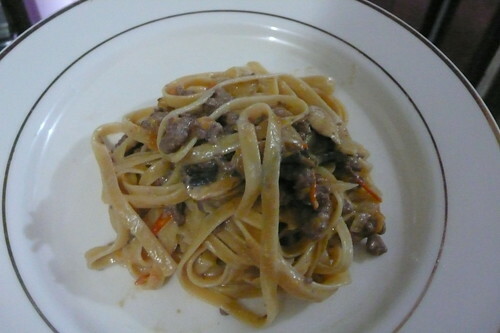 Recipe 5: Fettucini with Tomato Cheese Sauce, so converting the tomato cheese sauce on Recipe 4 and thinning it down with milk I combine it together with beef and mushroom and it becomes really yummy cheesy fettucini sauce. Recipe 6: Supposedly dessert, Strawberry Panna Cotta, taken from a friend’s recipe. But somehow because the wrong measurement or maybe the lack of preserverance it’s closer to milk pudding rather than Panna Cotta. So that’s 1 day and 3 recipes left! First day of 2010 and I wake up with terrible headache and sorethroat. So I down a paracetamol at 9 in the morning, and went back to bed. Guess what? I wake up at bloody 3 in the afternoon. First meal for 2010 was eggs florentine. There’s a little drama behind the cooking of this. I got all the ingredients ready and when I open the fridge … there’s no egg! What will eggs florentine be without an egg? Secondly, how the heck that the house of eggs distributor have no egg at all. So off I go to the nearest supermarket, for eggs! So this is day 1 and I only manage to cook 2 recipes today. 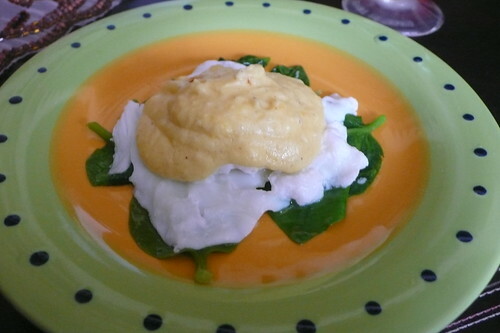 Recipe 1: Eggs florentine, combination of poached egg lay on bed of spinach and served with warm mornay sauce. First of all, I understand why Julia Child said that poached egg should be made by the freshest eggs possible. Secondly, when the recipe instruct you to make it with english spinach it really means english NOT Korean nor Indonesia. Lastly, plain flour means plain and not corn starch. The result from this stubborness is clumpy textured mornay sauce. I’m dying to have that creamy looking sauce on the recipe book. The taste however is delish! But I only got to 3/4 of the eggs florentine because the damn korean spinach is so sticky because of the resin it produces when it’s cooked. I shall try again tomorrow combining scrambled eggs with mornay sauce. Sounds yum! Recipe 2: Fettucini Carbonara with Portobello and Champignon Mushroom. A word of advice, if you want clean looking (white!) carbonara sauce, do not use portobello mushroom. If you’re willing to have dirty looking carbonara sauce, the combination of portobello and cream are divine! I have no idea that carbonara sauce is so easy to make. You just need to whip together cream, eggs and cheese and cook it together with your cooked fettucini and ingredients and shimmer until the eggs are cooked. Voila … you’ve got the fettucini carbonara ready! Had the dinner together with Raysa and she enjoy it! She licked her fingers at the end of the meal and that is the biggest gratitude I will ever get of my food. To start 2010, I want to start with a little Julie & Julia project for myself. For the next three days I’m challenging myself to cook 9 recipes in the span of 3 days. The aim is to set myself a target I need to achieve within a certain period of time. To begin the year with a small target that is reasonable, I think is a good omen. Because whether we like it or not, life is about target. We see deadline everywhere and there’s a certain number of indicator to your performance that you need to achieve. To set something that I must finished! The period is 3 Days and the target is 9 Recipes. Any additional recipe made within the period of 3 days will be accounted as outstanding performance. The reason is because I don’t want to put good ingredients to waste, since I’ve been doing it over and over again for the last couple of weeks since I’m too busy or lazy. On top of that, why bother buying cooking books if you only read it and never practiced what you read. The motto for the next 3 days: read, absorp and practice. The recipe that’s already on the list for tomorrow are: eggs florentine, creamy spaghetti with cantaloupe (still undecided on the spices I should use), cheesy tomato spaghetty with minced beef and/or the canneloni. It can be the tuna in tomato sauce canneloni or creamy spinach canneloni. In the meantime, happy new year and hopefully this year would be better (much) than the 2009.